With their network television deal with FOX firmly in tow, UFC president Dana White has promised an unforgettable upcoming year of mixed martial arts awesomeness. If the first five weeks of 2012 is any indication of what’s in store, fanboys will truly be in for a treat. The UFC will close out 2011 in style with a December 30th blockbuster between Brock Lesnar and Alistair Overeem. They will then take the following weekend off to recoup, but after that the action picks up at a fast and furious pace for four straight weekends. 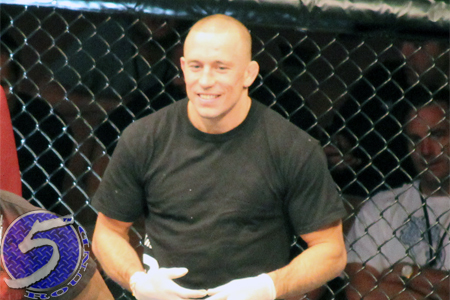 A pair of championship affairs will bookend the company’s torrid run, which is capped off by the biggest welterweight title fight in MMA history when Georges St-Pierre (Pictured) defends his throne against Nick Diaz at UFC 143. The Octagon’s return to Brazil, the organization’s debut on FX, as well as their follow-up show on FOX will also come within the first 35 days of 2012. Four live fights during a two-hour broadcast.